Awww…I think Jamie is so cute. 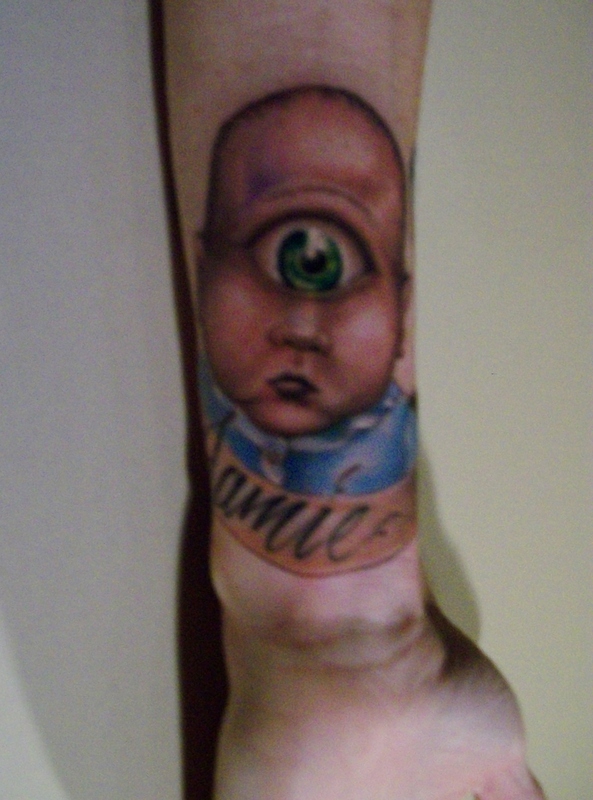 He’s on my tender, fishbelly forearm just like on his big sister Tera. This was (surprise!) the first cyclops baby Joe has ever inked. My Phineas tattoo is very angry this week. So, for Tera, Joe decided to pull back and not hammer the ink in so hard all at once. 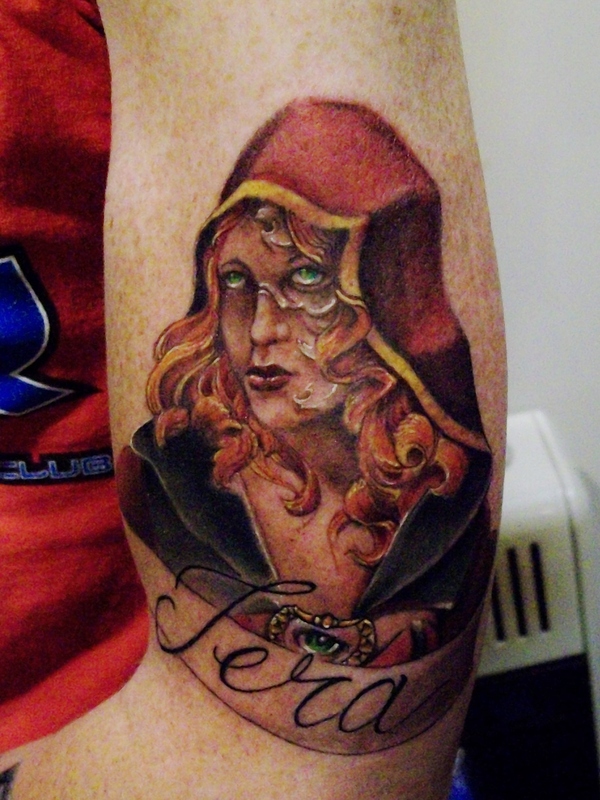 Once this initial layer heals, he’ll go back in and add cool tones to Tera’s shadows. Symbolizing Tera’s phreaky gift was a bit of a challenge. We decided to go with some layering on half of her face. This will pop out a little more once the cools are added. We’ll go back in during a future session and add a damask overlay to his top hat and jacket. I had to take a pause in my NaNoWriMo drafting for Epistle of Doff this morning. 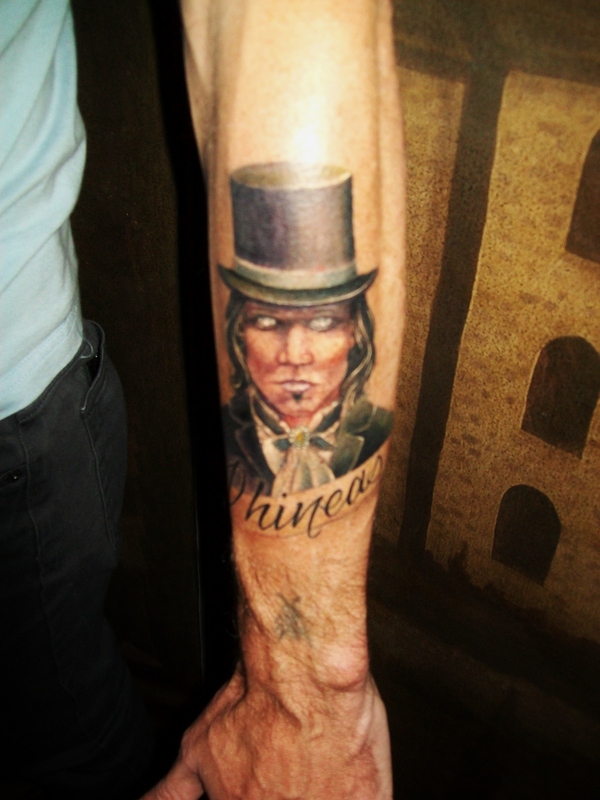 Reason: to consult with my tattooist on the sleeve images for my completed novel, Phreak Show. 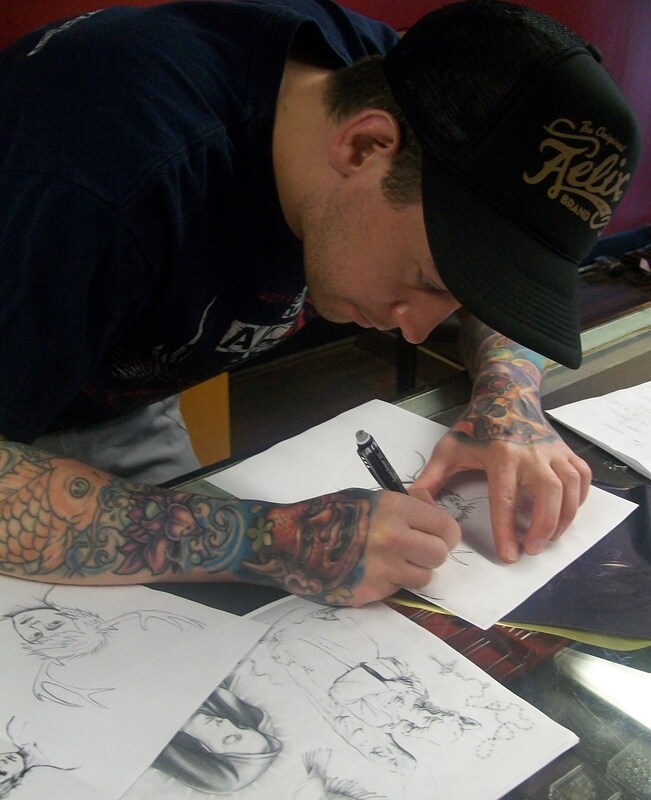 Joe has purchased skulls and such from my business & does amazing ink work. When the idea to immortalize my phreaky characters hit me, I decided to return Joe’s patronage. His earliest appointment was 7 months in the future. That future arrives next Saturday. Since NaNo means slacking on the blog, I figured the email I sent to Joe this morning was a way to show it some love. So here it is, chock full of links and words. 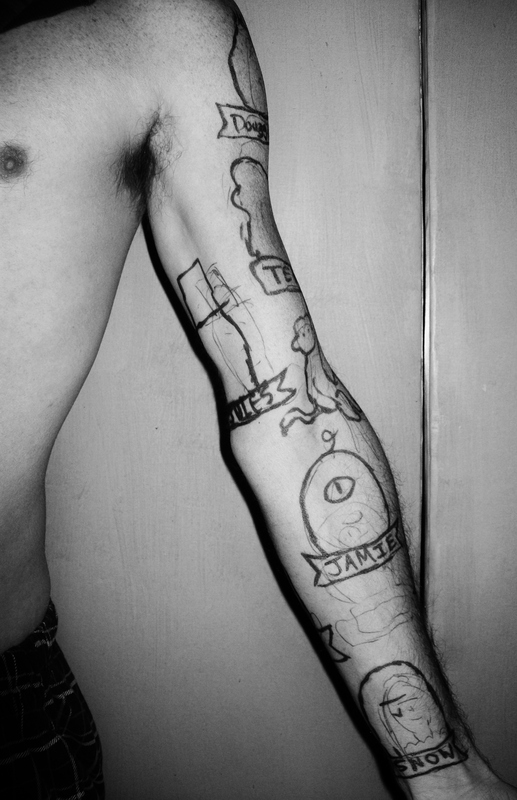 I’ll be chronicling the sleeve as it progresses, so y’all might as well get in at the planning stage. Lots of multimedia/data resources for this sleeve. Take a breath, give your creativity a good whack to get it cranked up, and dive in. Here’s a copy of the original facebook msg I sent you back in May, with my thoughts on the style. I want to do a sleeve of tats over the next couple months consisting of the characters from my latest novel, Phreak Show. It’s a Young Adult Fantasy, set in a modern-day sideshow with some steampunk/Victorian & magical tendencies.So, the characters are basically sideshow performers/freaks. I’m envisioning a bit of New School flare in coloring and style, with some high-contrast black, fused with some elements of old sideshow banner art.I can, of course, totally dredge up base images and we can work on the designs from there. But, I’m thinking how cool it’d be for the artist to get a vibe for the characters through reading the book. So, yeah, let me know if you’re game. This one specifically has the cabinet cards I made up for each character http://www.pinterest.com/LucasMight/phreak-show-cast-steampunk/ It shows them in their “everyday” forms, but I want the tattoos to add the element of their transformations into their sideshow personas like: Twiggy the Blubber Girl, The Prince of Torture (a tatooist! ), etc. The original, color images I used are here: http://www.pinterest.com/LucasMight/phreak-show-castoff-images/ and these may be more helpful for reference purposes. I’m thinking just head & shoulders for each one, with a ribbon/sideshow banner beneath with their sideshow names. I laid out the rough outlines/placement I have in mind. 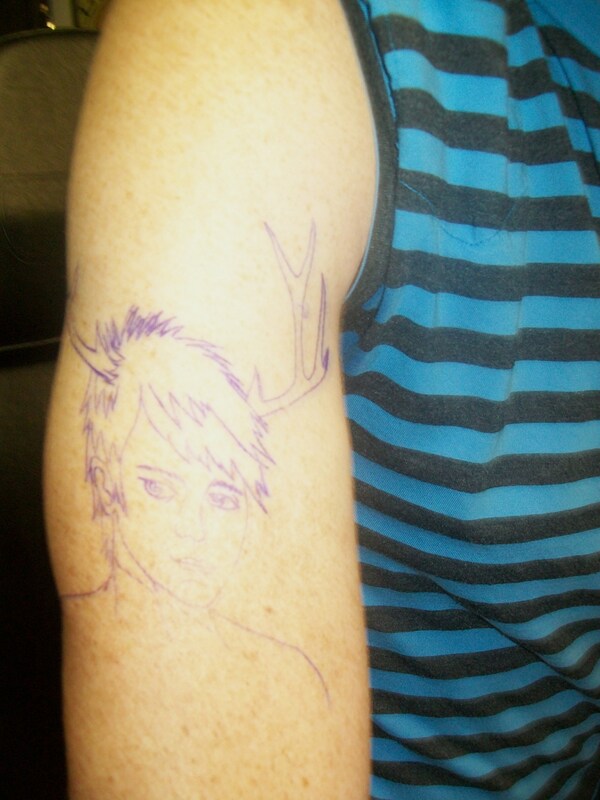 Pics of my (roughed in) sharpied left arm are attached. Those are the first 4. I’m thinking we can decide the order of the rest and space them out as we go, using the sharpie template along with sizing as a guide for their placement. I’ve also attached the manuscript. 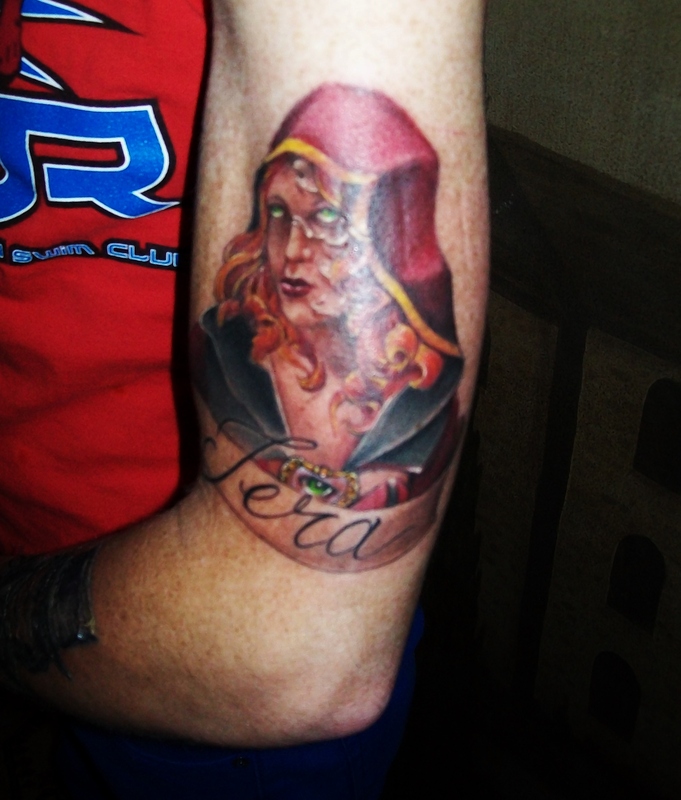 If you want to check it out, the main character, Tera, gets an effed up tat in chapter one, then enters the Phreak Show at the end of chapter 2. After that, the sideshow personas of the characters unfold over the following chapters. LAST LINK! lol – http://www.pinterest.com/LucasMight/tattoos-steampunk-otherwise/ This board will give you an idea of the types of tattoo styles/coloring/imagery I’m drawn to. I don’t want to dictate the style so much as I want you to interpret my ideas into your own Joe Crossman style. 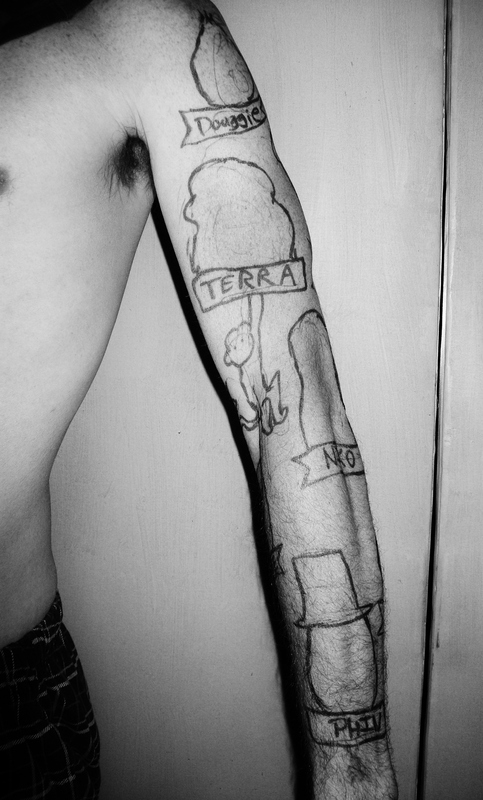 As long as the ink is helz-yeah-phenomenal, and consistent throughout the whole sleeve, I’m pretty open. Thanks, man. Look forward to seeing what you come up with. Joe doesn’t know it yet, but I plan on typing with my right hand in his shop next Saturday. NaNo is live & Doff wants out of me. There’s no reason [other than the pain of metallic, pissed-off wasps hammering into my flesh] I shouldn’t keep hacking away at the next novel while getting inked with characters from the previous one. Whether Phreak Show ever gets traditionally published or not, I absolutely love the characters and their story. Will I regret immortalizing them in my skin forever? Absolutely not. As long as Joe doesn’t eff things up for me like Niko did for Tera. 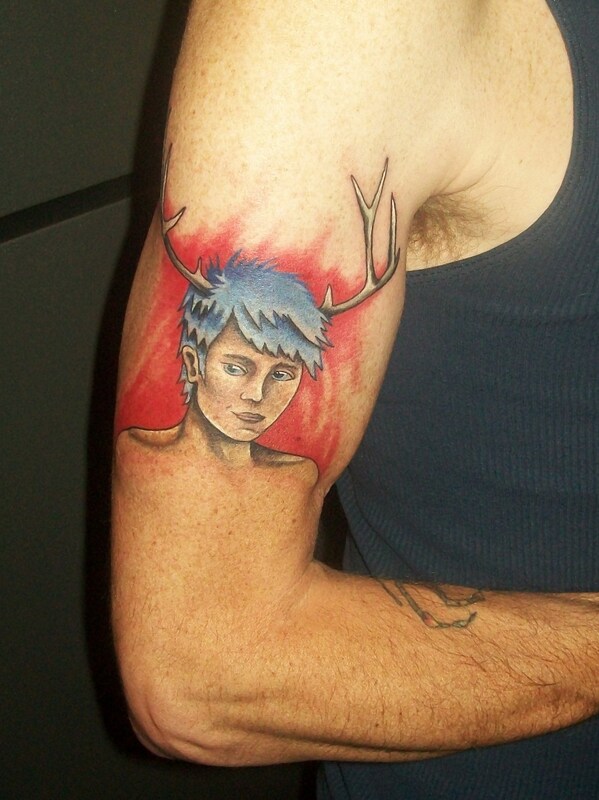 Or did Niko really mess up her tattoo of Jamie…? When an idea worms its way into my brain, it usually gnaws hard at my insula. What is this “insula” of which I speak? The prune-size region under the frontal lobes that registers gut feelings and is critical to the network which sustains addictive behavior. Usually, this idea-chewed region sparks and whines until I finally give in to its incessant demands. 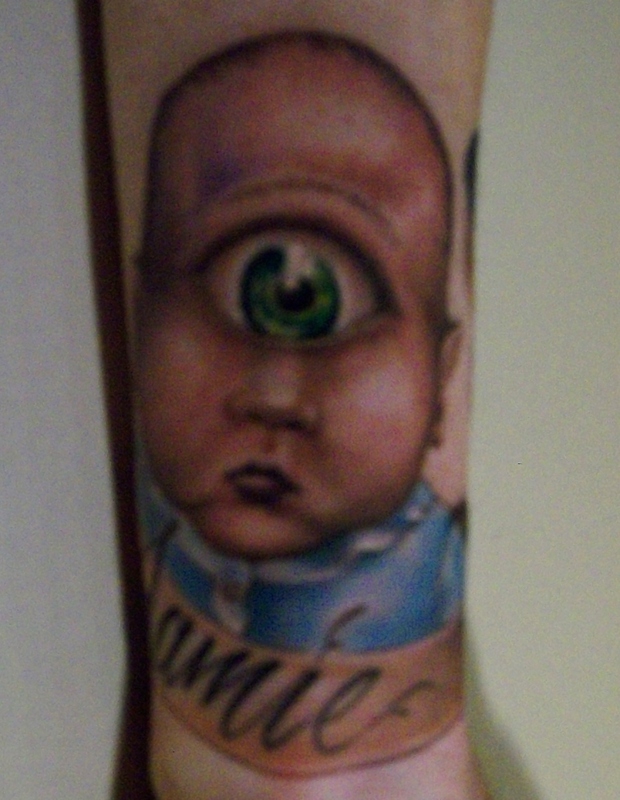 A recent idea lodged in place: a series of tattoos depicting my wickedly warped Phreak Show characters. Due to the insanely booked schedule of my preferred artist, that thought will be painfully niggling me until November. o.O Needless to say, I needed a short-term fix, a compromise, to keep my insula happy. 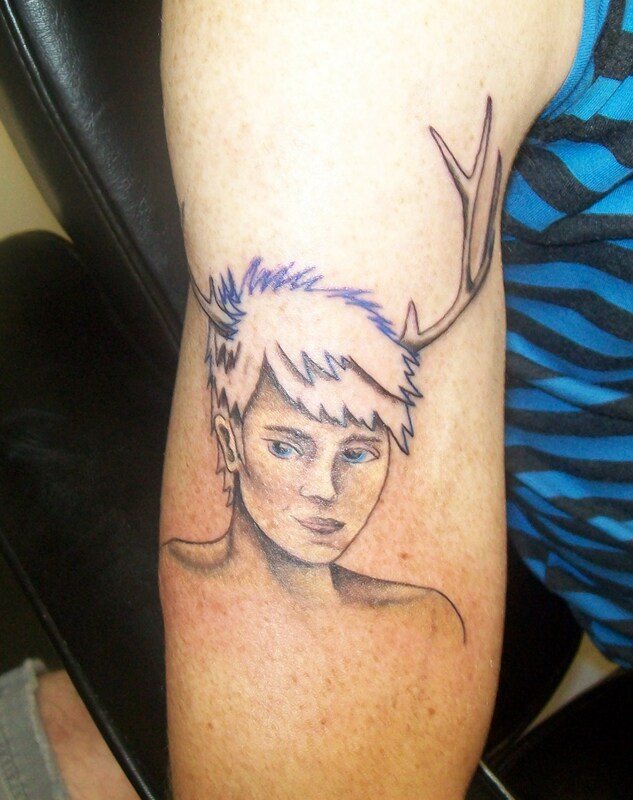 Thus, I am getting tattoos of my first 2 novels in the meantime. After a 3-week wait, Capritare got his chance to be immortalized on (in?) my skin yesterday. The artist, Josh Phillips of 42 Tattoo, did an amazing job of taking my loose sketch & transforming it into a permanent work of art on my arm. The engaging conversation proved as cool as the ink. I have this knack for getting folks to share stories. Maybe it’s because I’m a storyteller myself. The give-and-take, paired with genuine interest & asking the right questions, gifts me with many amazing conversations. Just ask the strangers I chat with in elevators, the hairstylist who is never bored while giving me a trim, or the random hitchhikers I scoop up. All for the sake of hearing their unique stories. Back to the tattoo. Josh shared a bunch of stories during our 3-hour session. A girl who got a sushi tattoo on her ribs, but, due to the pain, bailed before Josh added the word “vegetarian” floating up from it in wisps of fishy aroma. (Personally, she sounds more like a pescatarian, so I think it was probably for the best. 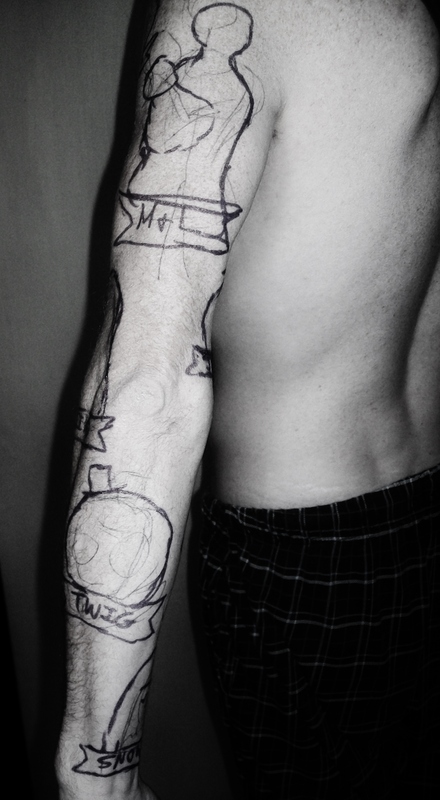 Tattoos are forever, after all.) Another story was about a dude who asked for “a tattoo that’s so bad I’ll wake up in the morning and wonder What the hell did I do that for?! 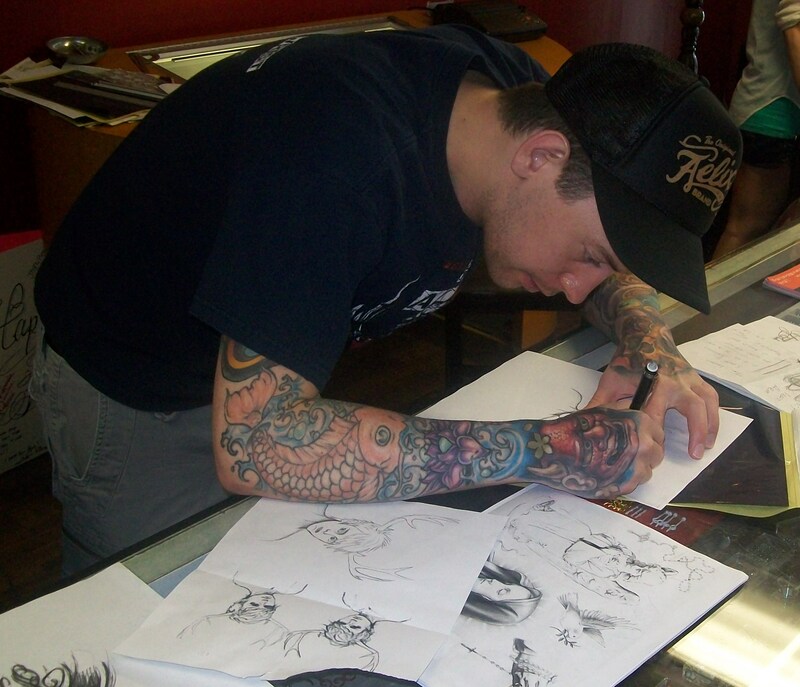 Can you do that for me?” Josh, like any artist who is willing to make the client happy, obliged. With the dude’s buddy shaking the chair, right-handed Josh inked the dude. With his left hand. And his eyes closed. He never heard whether or not the dude was pleased with the results come sunrise, but chances are that his expectations were met. Pre-tattoo. [i.e. 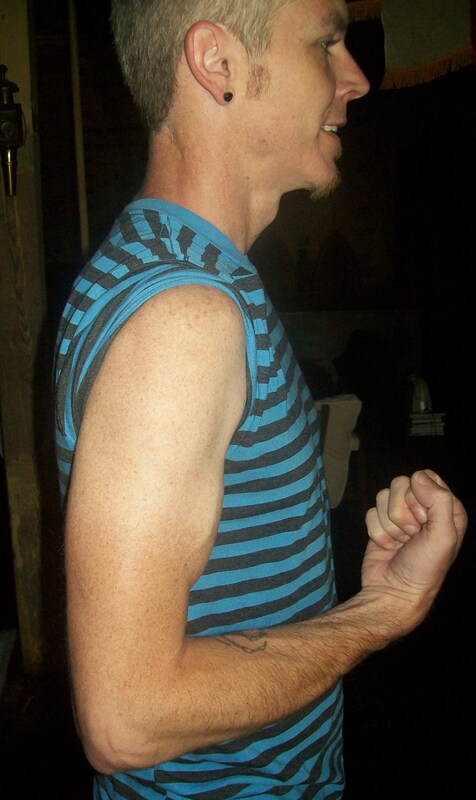 blank canvas] Flexed, so, you know, my arm looks all quasi-muscular. Josh prepping the stencil. 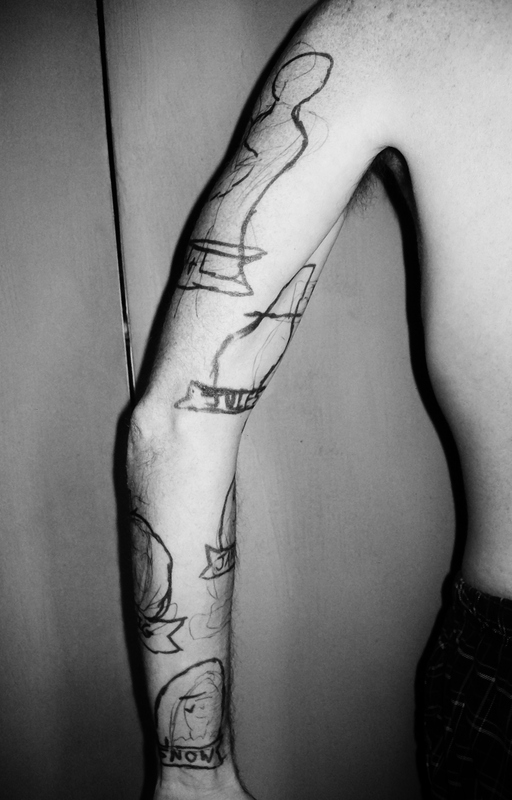 The raw sketch is by his inked-up arm. The stencil applied. 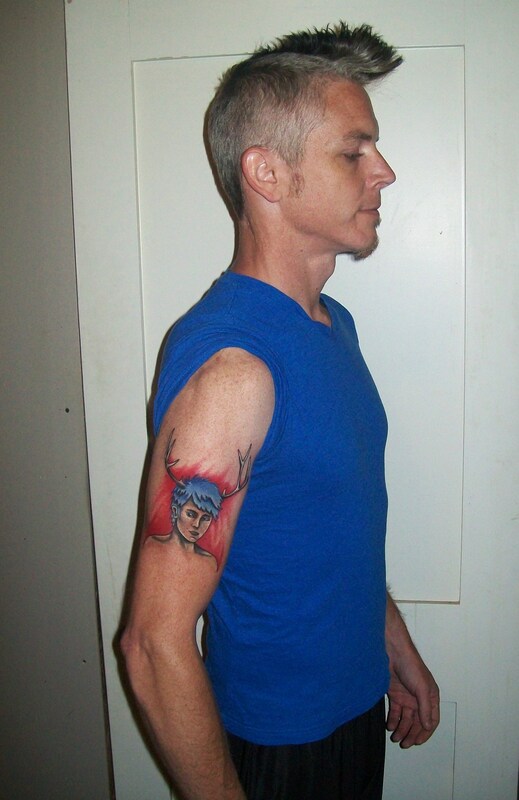 We planned the placement so the antlers wrap around my baby deltoid arcing down over my shoulder. The outline getting laid down. 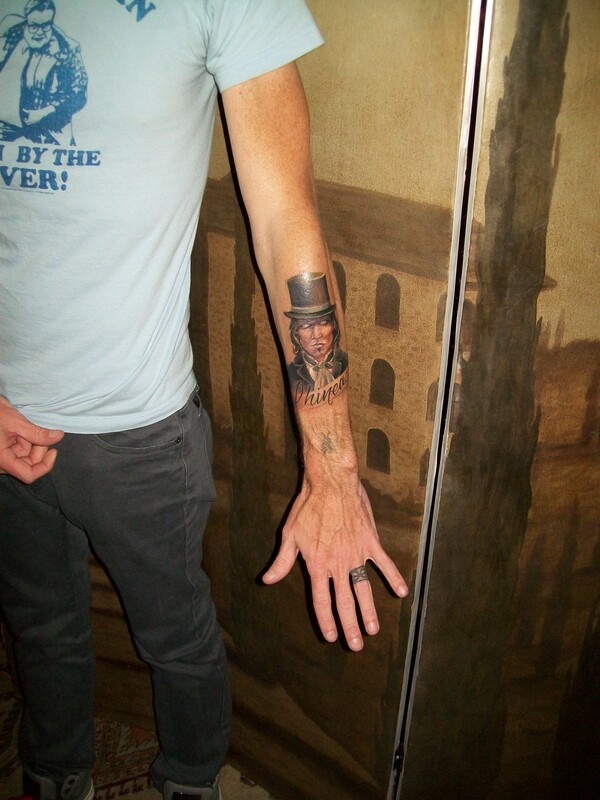 Compared to previous tattoos, Josh had a very light hand. Nowhere near bone-stabbing deep. The outline & skin-tone laid in. 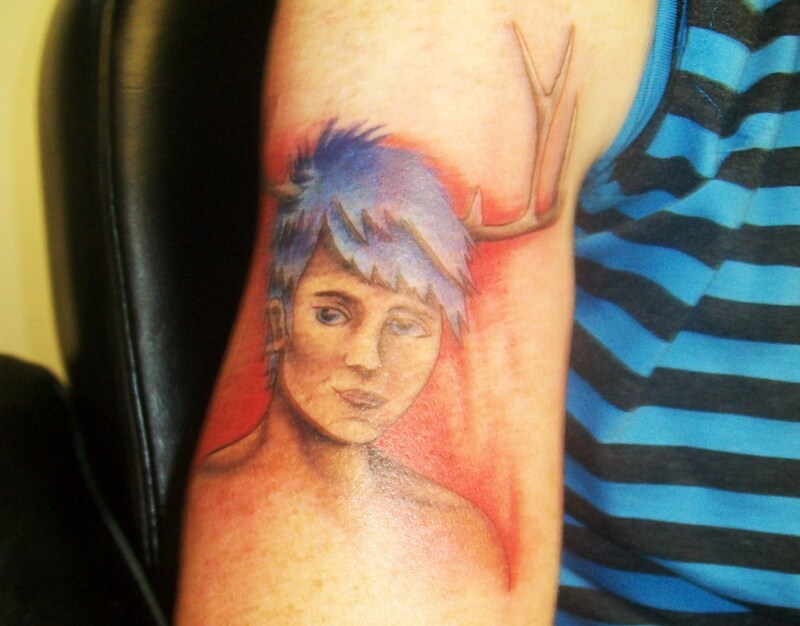 Josh chose to outline the top of the hair in blue, which I think was a great choice. Coloring in the hair with a 7-needled shader. Pardon the blurriness. Cap is done. The final cleanup hasn’t happened so some rogue red is smeared over his face. Just a bit more work on the background needed. The final image. About an hour after completion. I switched to a beater. 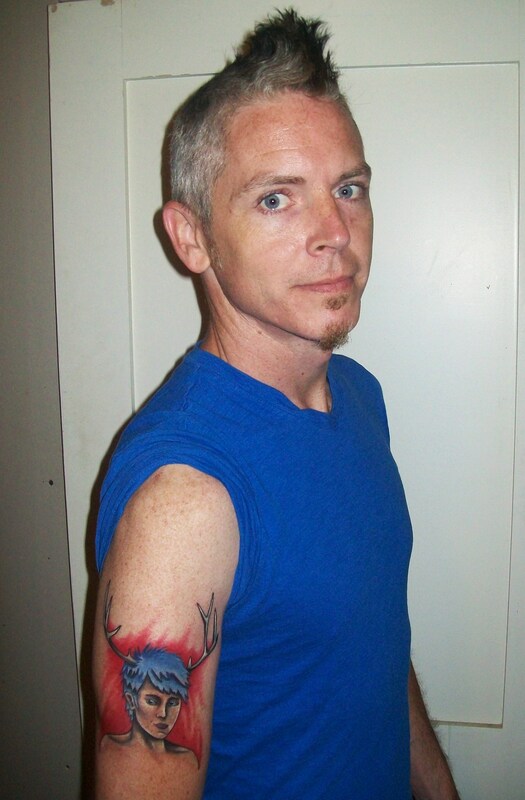 The worst ‘pain’ of the whole tattoo was the way the striped shirt’s sleeve was cutting up into my armpits during the inking. The day after. Cap looks fantastic. In the novel, he never ‘earned’ this full rack of antlers. So, this is a bit of wish-fulfillment for him. I can confirm that I am pleased with the results. My insula agrees, but the little bugger is still squirming & twitching for November. 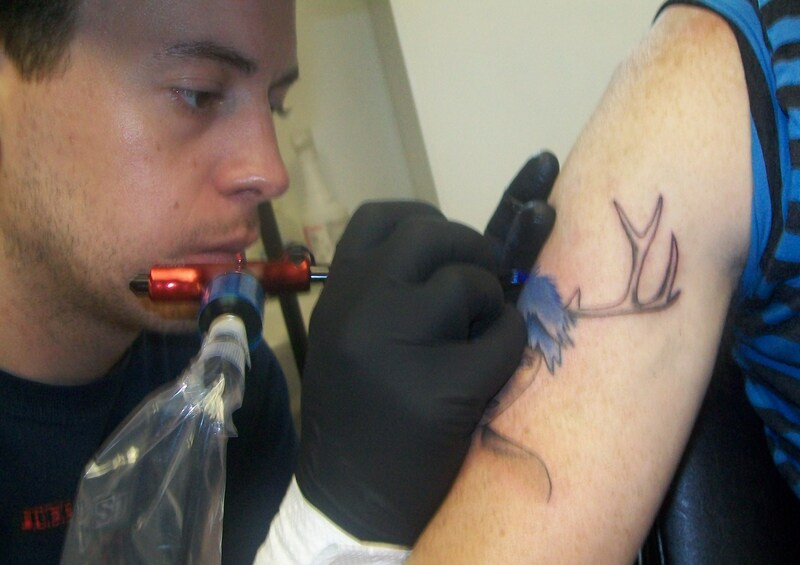 To keep the damn thing pacified, a tattoo for Freeborn is next on the list. I’m wondering if I can shake things up a bit—maybe get some hitchhiker to go get a tattoo with me? If we can get it done in an elevator, I’ll not only glean some amazing stories, but experience a pretty damn memorable one of my own.